I think these were all residential then. When I delivered papers down this street in 1957, there were several businesses along the way. Whenever I catch the smell of kneaded erasers, my memory escorts me back to an art supply store about halfway down the street. I’ve mentioned before that my dream was to have all the illustration board I wanted. Got there. Did that. Oh, look, Ma! No antennas on Bays Mountain. Obviously. This entry was posted in Kingsport TN ephemera and tagged 1920s, Bays Mountain Kingsport TN, Kingsport TN, Shelby Street, T.J. Stephenson on December 17, 2017 by Bob Lawrence. 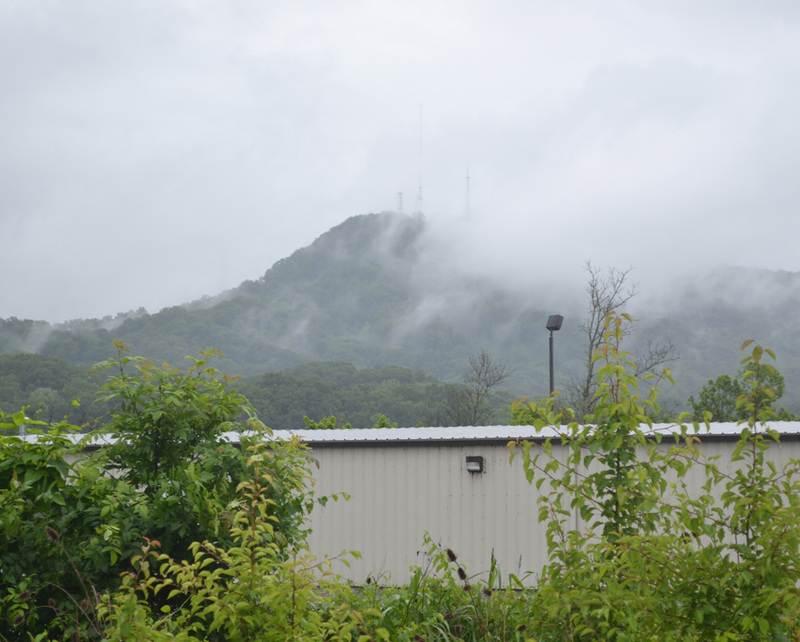 Coming down Industry Drive on a rainy day, I shot this view of Bays Mountain shrouded in clouds. This entry was posted in Bob's photos and tagged Bays Mountain Kingsport TN, bob lawrence photography, clouds, fog, rain on June 11, 2017 by Bob Lawrence.